I KNOW, so many sweets in a row. I have a super-easy chicken recipe all ready for you and a killer meatball dish coming up, but in the meantime, it's almost Thanksgiving in the US which means the (not literal but mental) change from autumn to winter is fast approaching and I want to get this pumpkin recipe to you now because it's too good to miss. Plus, I'm going to be in Asia for the next two weeks so you'll be a bit on your own, and it wouldn't be the Recipe Box Project if we didn't overdo it on decadent breakfasts. 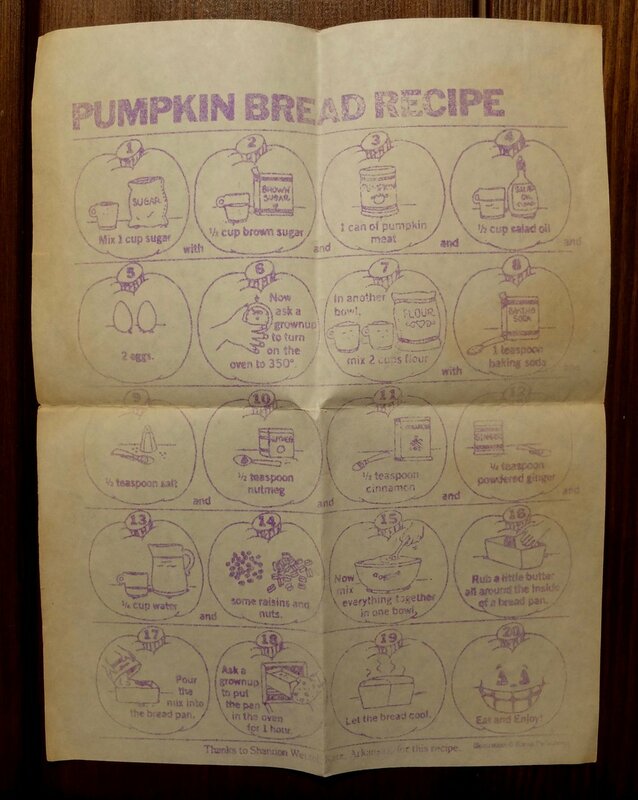 This recipe is an illustrated mimeograph made for kids (at least I assume it's for kids based on the instructions to 'have an adult turn on the oven'), so I'm not sure how it made it into the box. I was too young when Eleanor died to have been given something like this, so maybe it was given to my older (male) cousins and somehow wound up with Eleanor? Regardless, it's super adorable if a pain to try to cull together the ingredients since they're all listed by steps. The downfall of loads of pumpkin recipes is that they take 2 tablespoons of pumpkin, or ¼ cup of pumpkin or whatever, but you've already had to buy a whole can of pumpkin that you're now stuck with. You'll leave it in the fridge for a week or so promising yourself you'll make another pumpkin recipe before it goes bad, but there's only so much pumpkin you can take, and inevitably it turns before you have a chance, so you end up tossing ¾ of a can of pumpkin. Not a huge deal when you're stateside and pumpkin costs next to nothing, but here in the UK where I can only find it at American grocery stores and it costs £3 a can... I refuse to waste a single spoonful. So it was great to see that this recipe calls for an entire can- no waste! 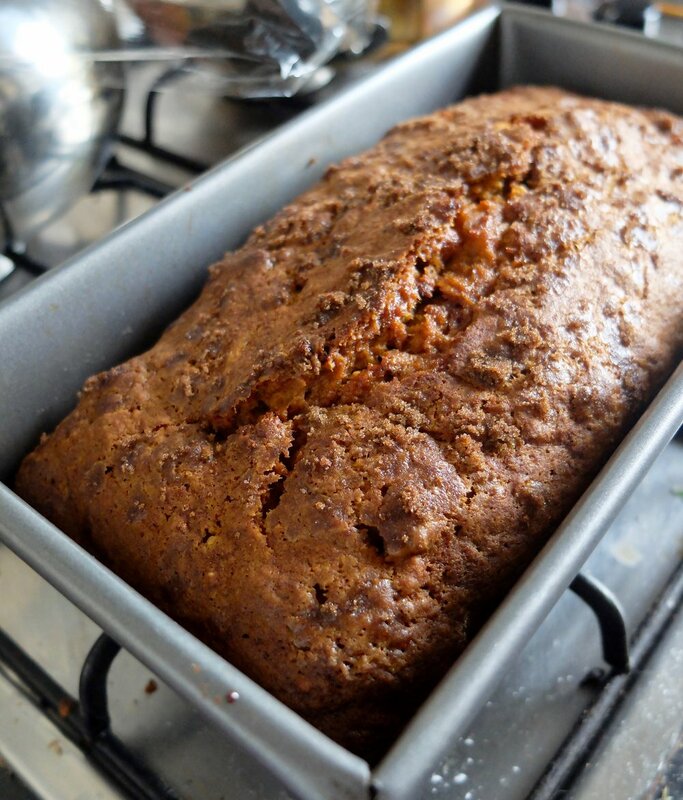 Between all the pumpkin and the use of oil instead of butter, this recipe is incredibly moist and delicious; add a handful of pecans or walnuts and any dried fruit you have on hand (cherries are particularly stellar) and you've got an excellent fall treat. Easy to transport, scented with the smell of autumn, dairy-free and easy to make nut-free, this breakfast-y cake is perfect with a hot mug of coffee or tea and everyone is sure to love it. It makes a perfect hostess gift for the person whose Thanksgiving dinner you're attending, and you'll be the favourite guest when they get up on Black Friday morning and realise they don't have to make breakfast. 5 spoons out of five. It's so easy a kid could make it, your whole house will smell like autumn, and it tastes even better with an extra sprinkle of brown sugar on top. Make this over the Thanksgiving holidays, especially if you're an expat missing the celebrations this time of year, and you'll be glad you did. Preheat oven to 175C/350F and grease 1 large or 2 small loaf pans. Stir together flour, baking soda, salt, nutmeg, cinnamon, ginger and nuts/fruit if using. Add water and stir gently to combine, then set aside. In a separate bowl, beat together sugar, brown sugar, pumpkin, oil and eggs until well-combined. Add flour mixture to sugar mixture and mix until smooth. 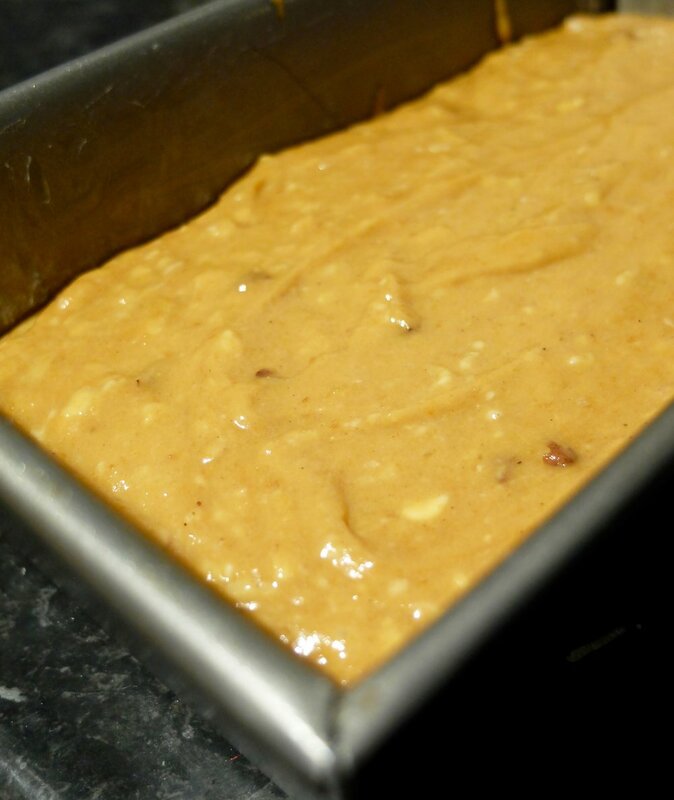 Pour into prepared loaf pan and top with extra brown sugar if using. Bake for 1 hour until a wooden pick inserted in the middle comes out clean. Allow to cool for 5-10 minutes, then turn out onto a plate and cool completely before serving.